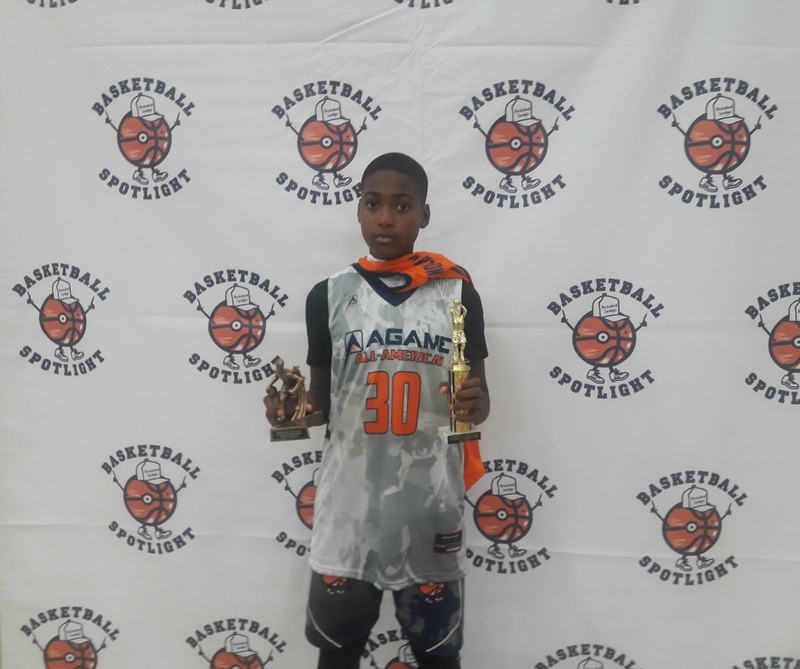 The Basketball Spotlight Future Phenom Camp 6th Grade Division gave us a look at some up and coming talent. Here’s Part 3 of our Top Performers. Amir Williams Forward (Delaware)- Last year at this camp Williams was a shot blocking specialist and rebounding machine. This time around Williams displayed his offensive game and we were impressed. The wiry forward looked legit on the wing as he made plays and scored the pill. He also made things happened in the paint and along the baseline. He was a total match-up nightmare. His play earned him the Best Prospect in the camp award. Thomas Sorber Forward (New Jersey)- Sorber’s inside presence was felt early and often at this camp. He understands how to get deep position on the blocks and power up for buckets. I like his touch off the glass and face up jump shot. If he keeps working on his footwork he could be a dangerous prospect. Nico Pena Guard (New York)- Pena May not be the quickest guard in the building but he has a good first step that helps him get past defenders and get his shot off. Speaking of shot he's known to score from anywhere on the floor. We will be checking him out on the Jersey City Boys Club squad this upcoming season. Su-Meer Alleyne Guard (Pennsylvania)- Alleyne once again proved to be one of the best guards in the event. His smoothness with the rock stands out and play making skills seems to be advanced. I also like the fact that he looks to have more inches in his frame. We look forward to watching him rock with Team Delaware on the circuit. The state of PA has a nice one in this kid. Mekhi Caldwell Guard (Delaware)- You can see that Caldwell is a coach’s son because of the way he runs the team. He makes the floor is balanced before he attacks and usually delivers the rock to teammates at the correct time. If you play off Caldwell too much he will make you pay by draining the outside shot. Correll Johnson Guard (New Jersey)- Johnson was as tough as they come on both ends of the floor. He stayed in attack mode on the offensive by penetrating the lane and finishing in traffic. He was a beast in transition because he could either score or drop a dime. On defense, he was a ball hawk and tried to lock down 94 feet. Robert Wright Jr. Guard (Delaware)- Wright is wired to score and can get it done from all three levels. One of his best weapons is his patented floater in the lane. He handles the rock well enough to also play some point guard. He’s another member of that talented and deep Team Delaware squad. Shamar Cox Guard (New Jersey)- We remember Cox from the Super Skillcase last fall and the South Jersey product showed improvement in his game. He grew a few inches and he's still a pass first type of guard but also added a scoring punch to his game. I love his poise and command of the rock when he’s running the show. Devin Minor Guard (Maryland)- Minor game consist of him being a top-notch ball handler and unique court vision. He can see over many defenders on this level which allows him to hit cutting teammates. He also can finish off plays well in the lane. This kid has a bright future ahead of him.